Moonlight Salvia -(s. greggii) Also called Autumn Sage or Texas Sage. 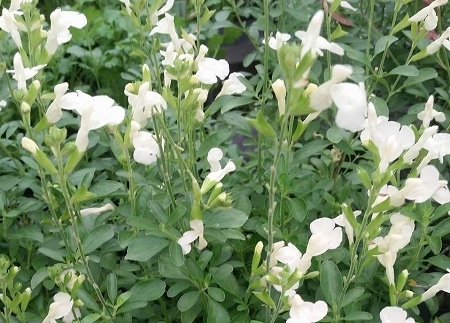 Creamy white to very pale yellow flowers attract butterflies and hummingbirds to the garden. Plant is drought and heat tolerant once established. Will quickly form a small bush approx. 2' x 2'. Blooming over a long period of time from Spring to first frost, hardy plant prefers sun and well-drained soils. Perennial zones 7-10. 1 live plant Live plant in 3 inch container.